Libbie Severin, 99, of Leigh, died Friday, February 10, 2017, at Brookstone Acres in Columbus. Funeral Service Thursday, February 16, 2017 10:30 A.M.
Visitation Wednesday 4-7 P.M. at the funeral chapel and Thursday 9:30-10:30A.M. at the Church Lunch in the church basement following the committal. Libbie was born June 30, 1917, on the family farm near Stanton, Nebraska to James and Mary(Hanzl) Sedlacek. She attended School District #42 in Stanton County. Libbie did housework for families in the area and on October 29, 1936, she married John G. Severin at St. John's Lutheran Church in Leigh. They lived and farmed south of Leigh, moving to town in 1973. John died in 1987 and Libbie remained in Leigh until 2014 when she moved to Prairie Village in Columbus. In November of 2015, she moved to Brookstone Acres. Libbie was a homemaker and "farm wife". She was an excellent baker and well known for her potato salad. 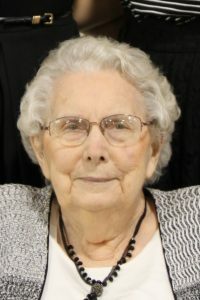 She was a very active member of St. John's Lutheran Church and enjoyed sewing quilts for the ELCW. She was also known as the "cookie lady" for vacation bible school. She was a Charter Member of the Extension Club, the Jolly Wilsonettes, belonged to the Woman's Club and was a 4-H leader. Libbie also volunteered at the Colfax County Fair for 40 years and was the Grand Marshall of the Fair Parade in 1997. She enjoyed nothing more than spending time with her family. Libbie is survived by her two daughters; Marilyn(Richard) Murlowski of Poway, California and Janet(Ken) Eisenmann of Leigh, four grandchildren; Becky(Jim) Scerpella, South Milwaukee, Wisconsin, Julie Hilger of Omaha, Douglas(Laura) Eisenmann of Schuyler and David(Kim) Eisenmann of Leigh. She is also survived by ten great- grandchildren;Lauryn Hilger, Marina and Isabel Scerpella, Joshua, Justin and Kara Eisenmann and Jacob, Gracie, Luke and Wyatt Eisenmann, two sisters-in-law, Ceola Sedlacek of Leigh and Mildred Matulka of Columbus. She was preceded in death by her parents, husband, three brothers;Jim, Stanley and Jerry Sedlacek and sister-in-law Evelyn Sedlacek.